US, 1952, 91 minutes, Black and white. Robert Mitchum, Jean Simmons, Mona Freeman, Herbert Marshall, Leon Ames, Barbara O’ Neil, Kenneth Tobey, Robert Gist, Jim Backus. Angel Face is high melodrama. 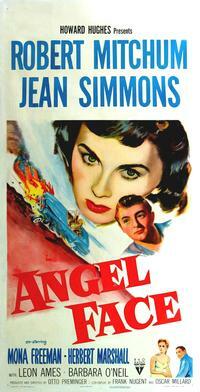 It also gives the opportunity for the young Jean Simmons to try her hand at a completely evil role. She had emerged in Britain in the 1940s as a strong screen personality in such films as The Way to the Stars and her Ophelia and Olivier’s Hamlet. She was to move to the United States with her then husband Stewart Granger and began immediately to appear in a wide range of films, some small-budget like this one and Beautiful But Dangerous, others more big-budget like The Egyptian, The Robe, Young Bess. Robert Mitchum is cast as a fireman who becomes a chauffeur, controlled by the evil Jean Simmons. He had appeared with her in the much lighter comedy, Beautiful But Dangerous. There is a very strong supporting cast with Mona Freeman as Mitchum’s girlfriend and Herbert Marshall as her doting father. The film was directed by Otto Preminger who had emerged as a significant director with his film noir in 1944, Laura. He directed Centennial Summer and the spectacular historical piece, Forever Amber. At this time he also challenged the rather puritanical standards of the Motion Picture Code with his slight comedy, The Moon is Blue. He also made Carmen Jones and Porgy and Bess and was soon to move into more spectacular films in the 1960s including Exodus, The Cardinal, In Harm’s Way. 1. How interesting and enjoyable was the film? The irony of the title and indication of themes? 2. Comment on the conventions of romance, melodrama, murder thriller, court-room drama. How were these combined and what Impact did they have? 3. The impact of the opening: death, hatred, Diane at the piano, the creation of a strange mood? The angel of death and the pervasion of this atmosphere throughout the film? 4. How attractive was Diane? The nature of her madness? her capacity for innocent-looking manipulation, her scheming and cajoling, her capacity for love and hatred, her selfishness? The love for her father and its possessiveness? her jealousy of Mrs Tremayne and her hatred? her hurting of Mary? Her possessing of Frank? Did she ever love Frank? Did the film make her motivation and character intelligible? 5. Comment on the hold that she had on Frank? Did he love her? Why did he do what she wanted? his awareness of her killing Mrs Tremayne? His reactions to the court-case? Allowing himself to marry her? Her making the wager with him at the end? 6. Was Frank the hero of the film? Presented as hero? His ordinariness at the beginning? His entanglement with Diane, his becoming a chauffer and kind of hireling, his being used by Diane? Did he realise how he was being caught up in this situation? His self-assertiveness after the his rejection by Mary? 7. How did the screenplay contrast Mary and Bill with Diane? Straightforwardness and simplicity? Mary's comment that Bill had met Diane at the beginning. 8. How well communicated was the relationship between Mr and Mrs Tremayne? The reason for the emigration, marriage, Tremayne's career as a novelist, Mrs Tremayne's business-like work, her attempted murder? Mrs Tremayne as a character, her relationship with her husband, her attempts to please Diane, her helping of Frank and Diane's lives? The sudden impact of their deaths? 9. How successful were the court sequences? Were they long and detailed enough? Were they well integrated with the rest of the film? The lawyer and his ploys and his speeches to the jury? His response to Diane's wanting to make a confession? 10. The sudden impact of Diane killing herself and Frank? Was this premeditated? Part of the pattern? 11. How real did the plot and characters seem? How bizarre? How much insight into strange motivations do such melodramas have?